We operate on a fortnightly basis and will attend your area the same day your bins are emptied by the local authority, after which we will label and number your bin for identification purposes. 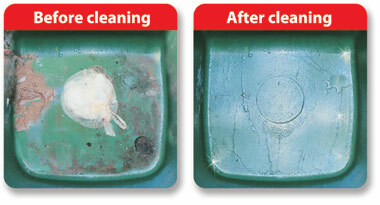 Once your bin has been pressure-washed inside and out using our alpine deodoriser, it will be returned to your property*. A member of staff will call at this time for payment. If no-one is at home, they will leave a company card stating your bin has been cleaned and will call back later that day, usually between 4pm and 8pm. Waste food, nappies, raw food packaging, takeaway packaging, pet waste etc – most people put at least one of these items in their bin on a daily basis. This can cause a build up of harmful bacteria, which is invisible to the naked eye. E-Coli, Aspergillus Fumigatus and Salmonella are all bacteria found in bins even when liners are used, not to mention flies, maggots, bad odours and vermin. Most local authorities now operate a fortnightly emptying service, which allows a build up of these hazards, putting yourself and others at risk. Giving you a professionally cleaned, hygienic and pleasant smelling bin. * Any rubbish left in your bin upon arrival will be placed into a red bin liner and placed back into your bin after cleaning. © 2019 Alderson Cleaning Services. All Rights Reserved.